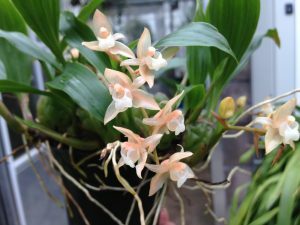 The genus Pholidota is a close relative of Coelogyne and we have seen several species in our travels to the mountain rainforests of the Himalayas and South East Asia. Most pholidota species have small flowers buy make up for it with large numbers of flowers and some lovely scents. Pholidota chinensis has bigger flowers than many in the genus and makes a very neat little plant with arching spikes emerging from the new growths. As its name suggests it is found in Southern China as well as Northern Vietnam. It is found in cool monsoon forest and we find it enjoys life in our Cool Asia section (minimum 10C) where we keep in damp all year with a wet summer.